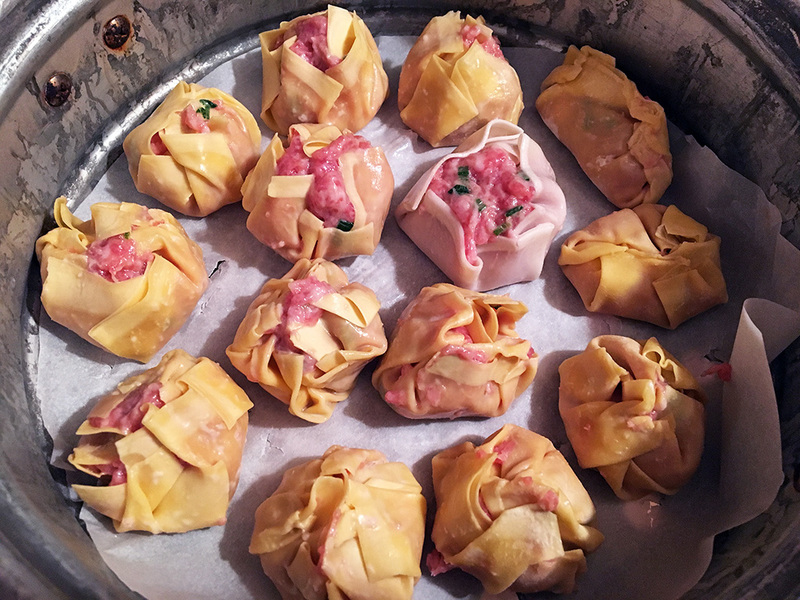 My love of dim sum is no secret and from that love came recipes for both shrimp and pork steamed shumai dumplings. Considering that these are my two favorites whenever I go out for dumplings, it only made sense that I would try and replicate them at home. 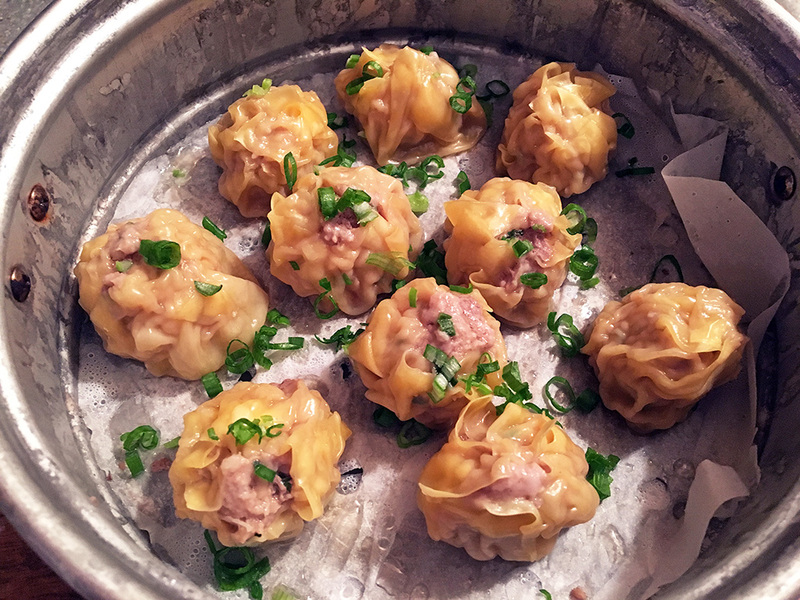 I’ve been making shrimp shumai for years, but I have to say that I was skeptical about making pork dumplings at home because I imagined that they’d come out tasting more like dense meatballs than dumplings. My fears were laid to rest, however, as soon as I tried the first pork dumpling. I’m so pleased with how these turned out! Not only are they easy to make, but they taste just like anything you would find in a good restaurant. 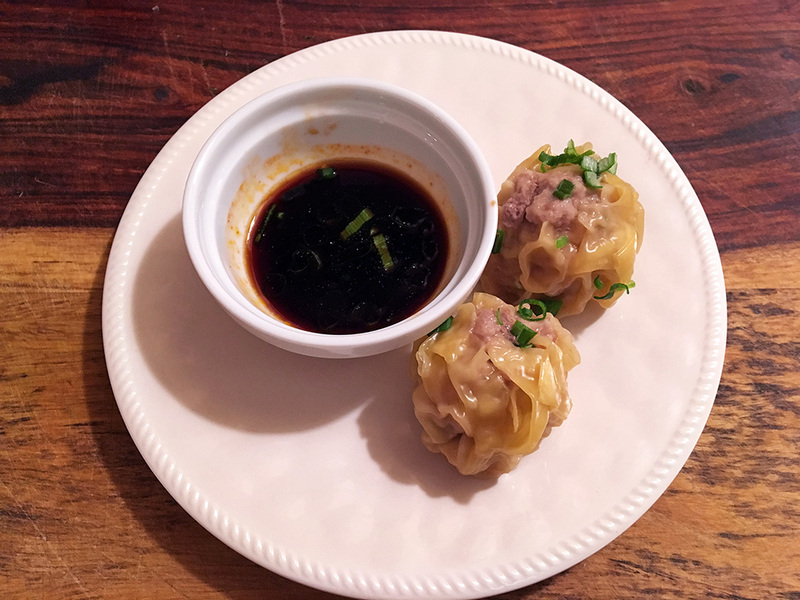 If you were ever on the fence about trying to make steamed Chinese dumplings at home, then I think you’ll find that this recipe is a good way to learn. Makes about 24 dumplings at calories 59 calories each. Steamed pork dumplings perfect for dim sum. 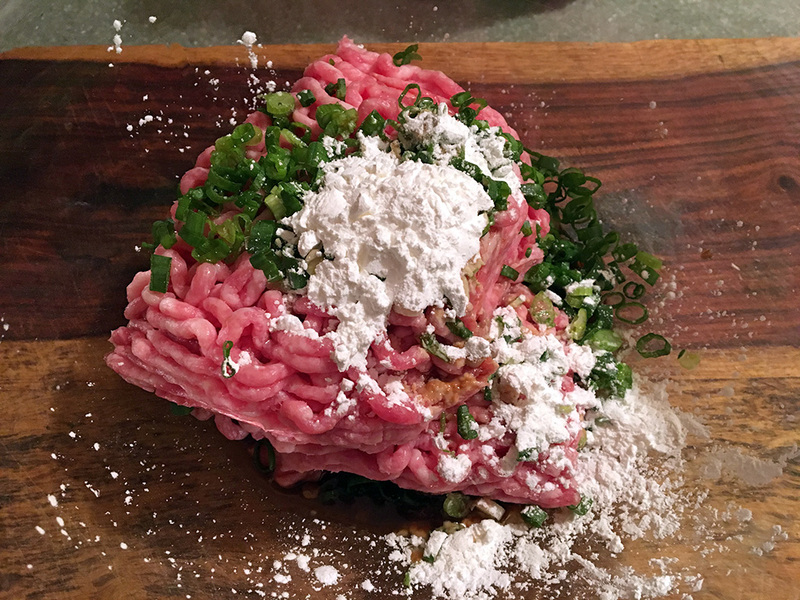 Note: The cornstarch provides some of that texture we often associate with dumplings. Sometimes that’s achieved using lard, but the cornstarch is a great alternative and works really well. Note: I used wonton wrappers for these. They are a little more delicate, but they let the flavors shine through. Also, you don’t have to use yellow wrappers, but I’ve noticed that pork is wrapped in yellow wrappers while seafood is often wrapped in white. Cut parchment paper so that it fits into the bottom of your steamer(s). Poke holes in the paper to allow the steam to get through. I used one rice cooker with a steamer attachment, so I needed to steam two batches. If you don’t have parchment paper to keep the dumplings from sticking to the steamer, you can also spray some cooking spray lightly on the surface of the steamer. Place the steamer with the parchment paper to the side so that you can fill it with dumplings. 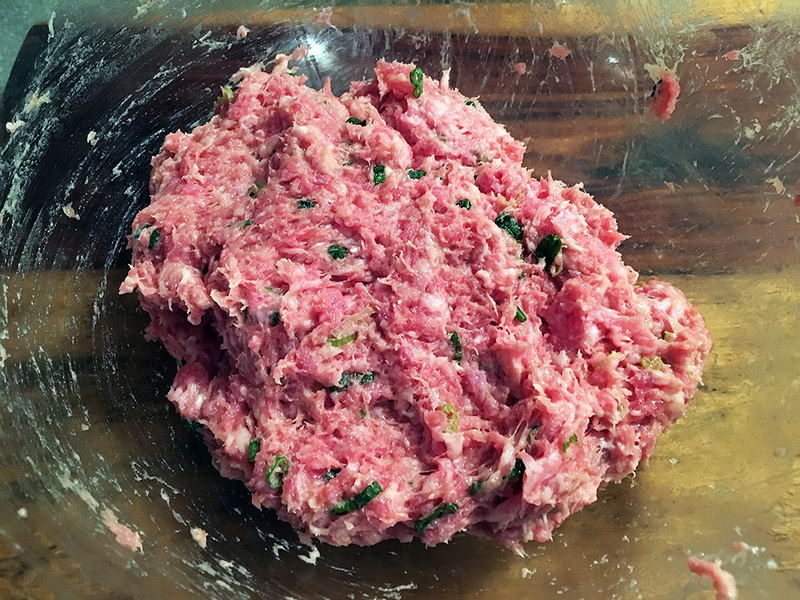 In a large bowl, place 1 pound of ground pork, 1 tablespoon of soy sauce, 1 teaspoon of sesame oil, and the three diced scallion sprigs. Despite what it looks like, there is a glass bowl in the picture below. I didn’t just prepare my ground pork on a cutting board. Mix the ingredients thoroughly using your hands (latex gloves are useful here), but don’t pack the mixture. Fill a small cup or bowl with some cold water. Get the dumpling wrappers ready (you can cover them lightly with a damp, but not dripping, paper towel to keep them from drying out while you are making the dumplings). Place a wrapper flat in the palm of one hand. Using your finger from your free hand, dip it into the cold water and lightly run it along the edges of the dumpling wrapper. This helps the wrapper to cling to itself when folding it closed. Using your hands or a tablespoon, scoop a small amount of pork into the middle of the wrapper. Then fold up the edges of the wrapper around the pork starting in one spot and working your way around in a circular motion pinching/pleating the wrapper into folds. There are all kinds of ways to fold dumpling wrappers to make them pretty, but I’m not a fancy man, so I just fold them up around the pork. They will end up looking like a crumpled star with an opening at the top to see the pork (or no opening if you used a little less filling). Place the completed dumpling into the steamer basket and repeat the steps to make dumplings until the basket is full. Make sure not to crowd the dumplings. There should be space between each one so that they don’t stick together! If you need to do more than one batch, just keep making dumpling and place them to the side on a plate so that you can steam the next batch right after the first one. If you haven’t already, bring the water in your steamer up to a boil. When you’re ready, bring the covered dumplings in the steamer basket over to the steamer, place the basket, and steam them for 8 to 10 minutes (don’t oversteam or the cornstarch will break down and you’ll lose some of the texture!). After that remove them from the steamer and serve them immediately before they cool down. If you want, you can garnish the dumplings before or after steaming with some extra scallions like I did or you could add sesame seeds, edamame, peas, or a variety of other items. As a sauce for serving, I like to keep it simple with some soy sauce and a few drops of Tabasco sauce. Throw in some extra scallions if you have any for good measure. This combination is just so perfect for steamed dumplings. Enjoy the shumai dumplings as part of a meal or even as a main course and try not to burn yourself eating them because they’re too good to eat slowly! Lovely ingredients and method. I must try some of these. They are an Oriental favourite when I’m out. Wowza! These look amazing. I already ate dinner but I’m hungry all over again looking at these. Another one of your recipes we’ll have to try! Please let me know what you think if you try it! The fact that they’re so easy is kind of dangerous, so I have to force myself not keep making them in case I get sick of it!